Mhairi is joined in her regular performing outfit by two of Scotland's finest musicians, Fraser Stone on drum kit and Michael Bryan on acoustic guitar. Their music is based on traditional and newly composed melodies from around the Cairngorm area, which lies in the heart of the Highlands of Scotland. Drawing inspiration from that stunning mountainous area, they capture the essence and soul of the landscape and nature in their music. Cairngorm is their debut album, which was released to great success in 2009. 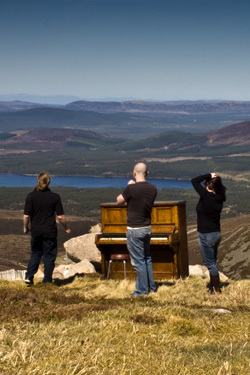 Never a group to shy away from the challenge, they spectacularly launched their album at the top of Cairngorm mountain to a sell out audience. You can read more about their famous album launch here. Performances by the Trio of Cairngorm have included leading Celtic Festivals, Celtic Connections, Interceltique Festival Lorient, Hebridean Celtic Festival to name but a few. They have also performed for Chamber music societies and Dance Festivals, from Concert Halls to intimate Arts Centres and bespoke house concerts. At home and abroad, indoors and open air. They love and thrive on a variety of performance opportunities, so if you have something in mind and think their music would work, please get in touch, no challenge is too big!